This guide was written for AccountRight Standard, version 19 of MYOB. Since there are many versions of MYOB, these directions may not be entirely accurate for your system but the concept is the same. Shoeboxed’s integration with MYOB works by assigning Shoeboxed receipts into the appropriate MYOB account code, then exporting into your MYOB account as Miscellaneous Purchases. Importing Your MYOB Chart of Accounts. 1. Importing Your MYOB Chart of Accounts. Go to MYOB, then select File > Export > Account > Account Information, and Click Continue. Go to your receipts tab then choose Export all button and choose Other. Scroll to the bottom of the page where you can see (Import Chart of Account). To import vendors, select Import Supplier Cards, under the path File > Import Data > Cards > Supplier Cards. Click Continue and select the vendors text file found in the MYOB Export folder. If the import is successful, you will receive this confirmation. 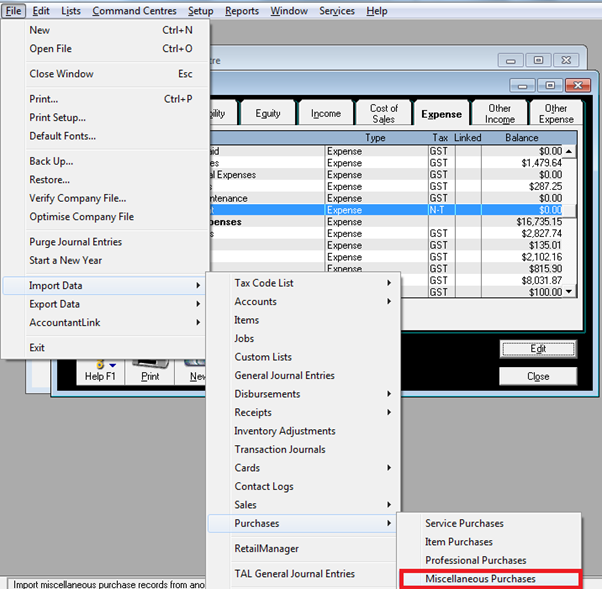 Select Import Miscellaneous Purchases the path under File > Import Data > Purchases > Miscellaneous Purchases. Click Continue and select the Receipts text file found in the MYOB Export folder. Then you will need to match the following fields up. If the import is successful, you will typically receive this notice with warnings. If both imports were performed successfully, the receipts should be updated to your specified account.